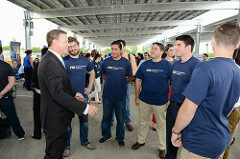 On Wednesday, at Florida International University’s Modesto Maidique Campus, FIU President Mark B. Rosenberg and Eric Silagy, president and CEO of Florida Power & Light, held a conference to introduce the just completed $3.5 million solar power array that is also a parking canopy and a research facility. FPL is the state’s largest generator of solar energy and operates three utility-scale, or universal, solar plants in Florida. The company is constructing three new 74.5-megawatt solar energy centers that will cost-effectively triple its solar capacity by the end of 2016.